Karina A. Monroy was born and raised in Southern California. In 2016 she received her B.A. in art and anthropology from the University of California, Santa Cruz. Karina’s upbringing as a daughter of Mexican immigrants has led her to seek a life and career dedicated to the social justice and representation of Latinx communities. Her work has been a process of decolonization and rediscovery of her ethnic identity. 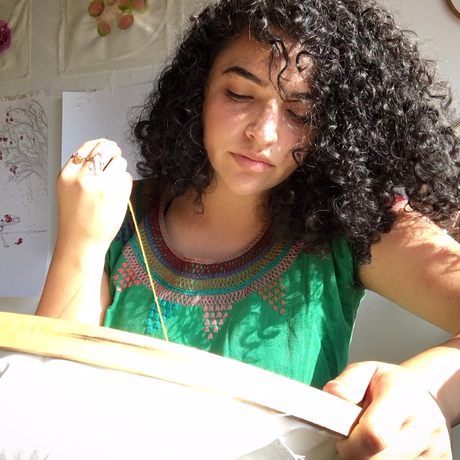 Karina’s primary research focuses on highlighting the often underappreciated and underrepresented brilliance, magic and feminine power of “abuelita knowledge” within Latinx-Chicanx- Mexican culture. Through shared story-telling and learning exchanges, Karina has been able to collaborate with Latinx communities from California to Mexico, and now Virginia. In addition to her community and artistic work, Karina takes joy in the little things in life like cooking, sewing, eating chocolate, talking to her plantitas and of course, drinking tea and spending time with her abuelita.